We LOVE super simple meals around here. 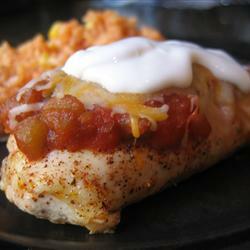 One of our favorites is Crockpot Salsa Chicken. We prep the night before, throw it all in the crock pot before work and come home to a DELICIOUS dinner! AllRecipes has a great oven recipe, too. Here is the oven recipe. Dump into your crock-pot and cook for 6-7 hours on low, (if using frozen chicken breast, its closer to 7 hours).